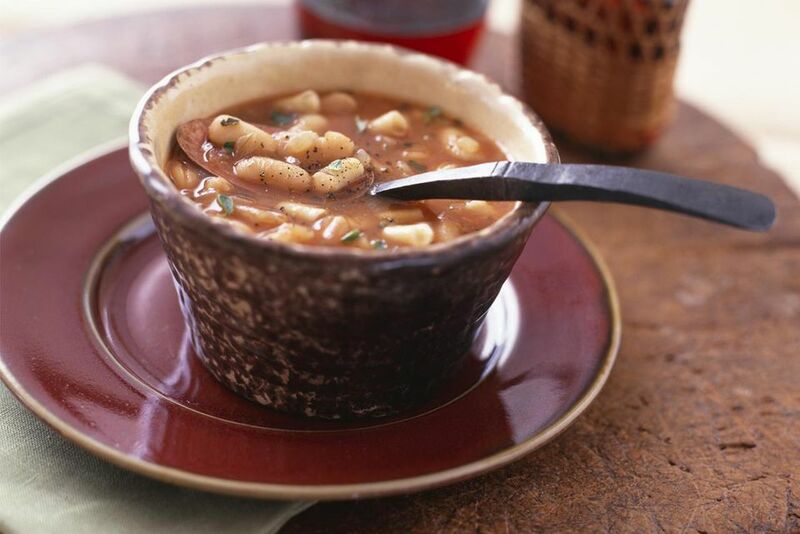 Bean soup or fassolatha (fah-soh-LAH-tha) will be on the menu at least once a week in a Greek household. It's also a staple of the Lenten season. This recipe makes 6 - 8 servings and is hearty, nutritious, and delicious. Soaking dried beans rehydrates them and results in more tender beans and shorter cooking time. If you don't have an extra day to soak the beans overnight, you can try the quick soak method below. Add beans plus enough water to cover beans by 2 inches to a pot. Add 2 tbsp. salt and stir. Bring beans to a rolling boil. Turn off heat, cover, and soak for an hour. Drain and rinse beans under cold water before using. Add the beans, water, and olive oil to a large, non-reactive soup pot and bring to a boil. Reduce heat and simmer covered until beans are tender but not mushy, about 1 hour. Season the soup with salt and freshly ground black pepper to taste. Remove the bay leaf and sprinkle with chopped fresh parsley before serving. Note: Adding an acidic ingredient like tomato to the soup before the beans are cooked can toughen the skins on the beans.